Hanoi, Halong Bay, Hue, Hoi An, Ho Chi Minh City, My Tho (Vietnam), Siem Reap, Angkor Wat (Cambodia), and more! 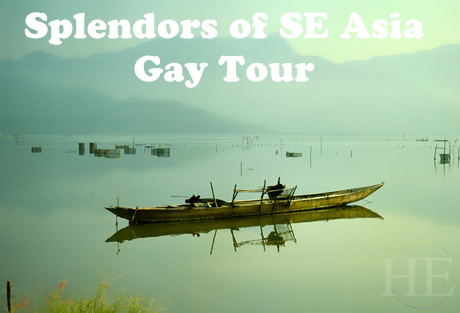 When you join our Splendors of Southeast Asia Gay tour, you are embarking on a journey of the spirit. It is a personal discovery of a diverse and culturally rich area of the world. Fascinating religious artworks, regional customs distilled from centuries-old traditions, as well as exotic music and dance will spark your imagination. Step inside ancient stone temples and luxurious, colorful palaces. 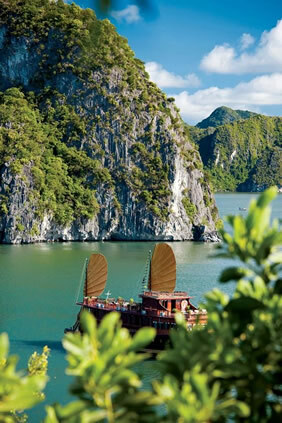 The natural spires of Halong Bay and the rambling jungles of Cambodia will remind you how far you've traveled. We'll feast on French-inspired Vietnamese cuisine in Hanoi, relax on China Beach, meet friendly locals in Cambodian villages, and spend our nights in some of the finest accommodations in the region. 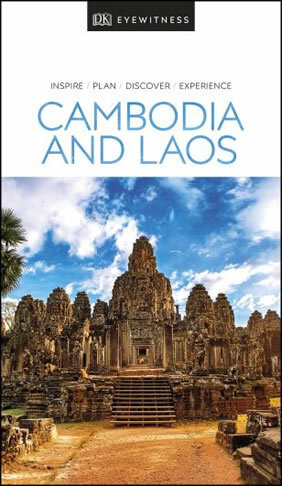 This is the perfect journey for anyone who wishes to explore the diverse cultures of Southeast Asia and rejuvenate. For those with extra time to spend in Asia, we offer a four-day post-tour extension to Luang Prabang, Laos – see Extension for details. 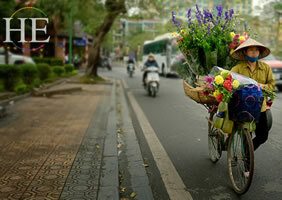 • Ride a tuk-tuk motorized cart through the tree-lined streets of Hanoi. • Learn about Vietnamese cuisine with a visit to a local market and kitchen visit with a top chef. • Relax for a night in a Chinese junk on Halong Bay among the camelback rock spires. 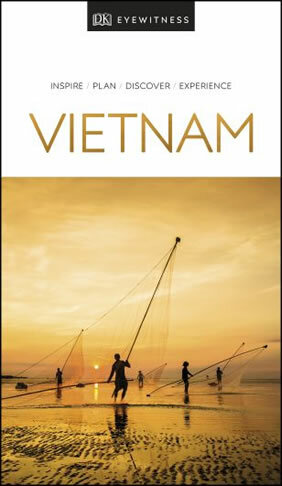 • Experience the excitement of Saigon (Ho Chi Minh City), then cruise past the small villages of the Mekong Delta. 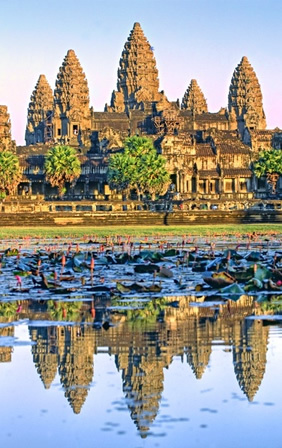 • Explore the Lost Kingdom of Angkor Wat and its magical temples. • Unwind in world class accommodations after each day of touring. 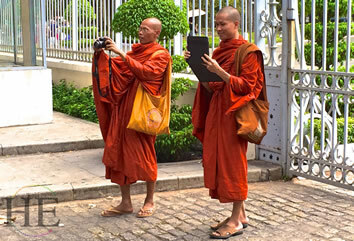 • For those with some extra time, join our extension to the magical city of Luang Prabang, Laos. North American travelers will cross the International Dateline, so will need to leave home one or two days before the first tour day. Many flights arrive in Hanoi in the late evening, so nothing is planned for Day 1 other than a good night's sleep at our grand hotel. In Hanoi we will stay at the Hotel Sofitel Legend Metropole. This distinctive hotel, well situated in the heart of the city, was renovated in 2001 to celebrate its 100th anniversary. If you arrive early enough for dinner, you will find a wide selection of cuisines available in this cosmopolitan capital city. For anyone who arrives for the gay Vietnam tour a day or two early, we will arrange an optional cooking class. This is a special treat as we join one of Hanoi's accomplished chefs for a visit to the nearby market to select items for the day's meals. 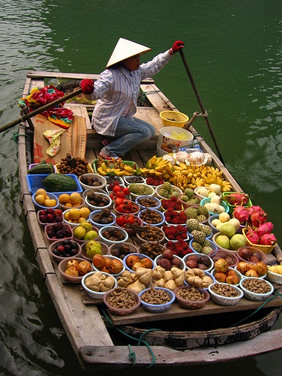 We then return to the restaurant kitchen to see how all of these fruits, vegetables, meat and spices come together to create the special dishes for which Vietnam is known. This feast will then be our lunch! After breakfast, we will devote the day to touring the city and learning of Ho Chi Minh's heritage. The Paris-inspired gem of Hanoi is resplendent with classic French colonial architecture, lovely city parks, art studios and fine cuisine. During our tour we will visit the Temple of Literature, dedicated to Confucious and scholarly study. We will visit Ho Chi Minh's Mausoleum, where lines of respectful admirers and curious visitors wait to view his remains. We will also leave the bustle of the city to visit West Lake and see the gentle lines of the Tran Quoc Buddhist Pagoda, a 1,400-year-old pagoda that was moved to this location over a century ago when the terrain of its original location became unstable. Lunch will be at a unique Hanoi restaurant. After lunch we will ride by Vespa through the small city streets of Hanoi's Old Quarter to the Ngoc Son Temple on a small island in picturesque Hoan Kiem Lake. We will then return to our hotel for a short rest then meet up again to attend Hanoi's famous water puppet theater and have our welcome dinner. Day 3 - Overnight on a Halong Bay Junk! This morning we will drive four hours east from Hanoi to Halong Bay, where thousands of huge limestone outcroppings jut above the water creating a serene and surreal world of water and stone. We'll spend the afternoon and overnight in a traditional Chinese junk to cruise the bay. Let's pause to explore some of the smaller islands by swimming, kayaking or walking, and enjoy our meals on board. Those who want to get a different perspective on Vietnamese cuisine can join the chef's cooking demonstration. We'll spend tonight being pampered by our crew. In the morning you can awaken with a Tai Chi session on the deck of our boat in the dawn’s early light. Our junk will resume course this morning and we will be lucky enough to stop and visit a natural cave. Once back on dry land, we’ll drive to Hanoi, making a stop in Yen Duc Village to visit the pagoda and walk around the village. We will enjoy lunch at a local restaurant and then visit DongHo painting village, which is considered a fine reflection of the traditional aesthetic values and humanitarian desires. Dinner will be in Hanoi this evening. Enjoy a relaxing breakfast and morning before we head to the airport for an afternoon flight to Hue, where we will transfer to our lovely colonial-era riverside hotel for a two-night stay. This evening we will enjoy a scenic rickshaw ride through the streets of the old city. Tonight you will feel like a local. We start our day with a short bike ride (with cyclo taxi ride available for those prefer it) to Kim Long Village, 4 miles from the center of Hue. Here we will see the traditional houses and gardens that reflect an ancient way of life in this community, and have lunch in one of the homes. In the afternoon we will pause for a tea break then visit the Thien Mu Pagoda. Food will continue to be a theme of the day as we close out the day with dinner at a Vietnamese-French restaurant in a historic building near the Forbidden City. Before departing Hue we will explore the Citadel from which the Nguyen Dynasty (1802-1945) emperors once ruled a large empire, along with mausoleums honoring two of the emperors. After lunch we will drive south to Danang via the scenic Hai Van Pass of the coastal mountains, with tremendous views up and down the coast. In Danang we will make a short visit to the Cham Museum showcasing 1000-year-old sculptures from the Hindu Champa Kingdom. We finish the day in Hoi An, where we check into our beachfront hotel and have dinner at a nearby restaurant with a peaceful garden setting. This morning we will drive about an hour inland to the My Son Sanctuary to explore the remains of the Hindu Temples of the Champa Kingdom that have survived a millennium. Some have been partially restored, but unfortunately others were sad casualties of the 1970s war when Viet Cong soldiers hid among the irreplaceable monuments of the past – and American planes bombed the Viet Cong positions. We will return to Hoi An for lunch will be in a restored colonial building along the riverside. After lunch we will tour Hoi An's Old Quarter to see some of the 850 well-preserved buildings from this historic mercantile town where traders from as far as China, Japan, India and Europe once exchanged goods. One stop will be at a lantern-making cottage where we will even learn how to make our own lanterns. We return to our hotel in the late afternoon, with the evening and dinner on your own to explore our resort. Today we are more than halfway through our trip, and we will take our time to rest and relax while enjoying our waterfront hotel this afternoon. But first, we will enjoy a cooking class with Streets International Association. Enjoy your free afternoon and we will meet up later in the night for dinner. After breakfast we will transfer to Danang Airport (affectionately referred to as DAD airport), then board our flight to Ho Chi Minh City, the contemporary name of the historic city that even Vietnamese are again calling Saigon. Upon arrival we'll transfer to our hotel home for the next two nights in the heart of the city. This afternoon we will explore Saigon’s Colonial Residential Quarter and the Cho Lon district with its Chinese heritage, including the Thien Hau Pagoda and the Binh Tay Market. We’ll enjoy a casual dinner out on the town together. Today we get an early start and quickly leave behind the urban landscape of Ho Chi Minh City as we drive toward the Mekong Delta city of My Tho. There we will board a boat and cruise past the islands, orchards, and villages that have built up over the centuries where the Mekong River flows gently into the sea. Later we switch from boat to horse-drawn cart to visit small villages that feature traditional handicrafts of the region. We’ll also stop at a coconut candy workshop and discover the process of delicious dried coconut. After lunch, we will enjoy the “grand finale” of the Vietnam portion of our tour will be a performance of the AO Acrobats, who mix traditional acrobatics with contemporary design to tell the story of traditional village life in southern Vietnam. Dinner will be on our own tonight, either before or after the show, depending on show time. You can try an Italian restaurant for a break from Asian food, or look for one of the fine French Vietnamese cafes popular with locals. Day 12 - Saigon then on to Cambodia! After breakfast, we will head out to one of the most dramatic sites in the history of the Vietnam War: Cu Chi Tunnels. This underground city is an immense network of connecting underground tunnels, which are just a small portion of the massive tunnel network that underlies much of the country. For lunch, we will head back to Ho Chi Minh City. This afternoon we will explore the old colonial residential quarters, including the contemporary Reunification Palace and the 19th century Notre-Dame Cathedral. This evening we will transfer to the airport for our flight to Cambodia. 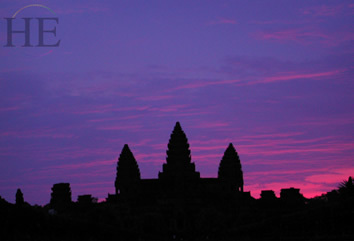 After arriving at the Siem Reap airport, we will transfer to our unique hotel that captures the Cambodian spirit. This five-star resort will be our home for the next three days and offers a variety of services and amenities (including spa treatments) which you may want to indulge in during your stay. This morning we will begin our exploration of the vast Angkor Wat complex of building and temples by visiting Angkor Wat itself. This monument was built in the 12th century and is dedicated to the Hindu god Vishnu. It is considered one of the masterpieces of the Khmer architectural style. 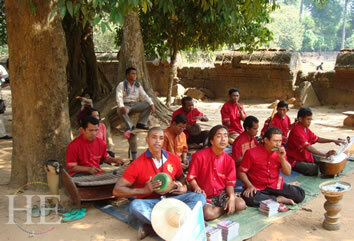 We’ll have lunch nearby then visit the Temple of Bantey Srey, “the citadel of women”. Then we will drive back to Siem Reap through the Cambodian countryside with a stop to visit the amazingly restored Bantey Samre Temple. Tonight we will see the Cambodian take on both rock music and acrobatics at the Phare Cambodian Circus Show, known for its passionate young acrobats and musicians, and their sense of humor during their performances. On our last day in Cambodia, we’ll visit the ancient capital of Angkor Thom by “rem ok” (motorcycle trailer). Here we will view the famous Bayon Temple, once surrounded by 54 towers. Next to explore is Baphuon, which has been fully restored by a team of French archaeologists, taking over 16 years to complete. In the afternoon we will visit the Ta Phrom Temple, which is still surrounded by jungle. Then stroll through the busy market and see an artists studio. We will finish the day with our Farewell Dinner celebration on our last night in Cambodia. This morning we will drive outside Siem Reap to see the lakeside communities of Lake Tonle Sap. From the village of Kompong Khleang we will take a small boat to see the small fishing communities around the lake, and the stilt houses that keep families above the highest water levels but require climbing up to 3 stories above the water during the dry season (January through May). From Lake Tonle Sap we will return to our hotel to collect our bags and check out. Those not on our extension will transfer to the Siem Reap airport for flights home or to Bangkok or Hong Kong or elsewhere in the region. Please let us know if you would like assistance for additional travel. If you are joining our Luang Prabang extension, we will fly directly from Siem Reap to Luang Prabang today. This will be either on a non-stop flight or with a change of planes in Bangkok, depending on flights available that day. See the next section for details about our stay in Luang Prabang. Whether you’re joining the extension, flying home, or perhaps taking a few extra days in Asia, wherever you travel next, bon voyage! After the flight from Siem Reap our Laos Extension participants will start our exploration of the capital today from the comfort of our deluxe hotel in a restored building that combines French colonial charm with a contemporary style. We'll enjoy the splendors of Luang Prabang, the ancient capital of the Lan Xang Kingdom, the "Land of a Million Elephants." We'll spend three nights here, allowing plenty of time to leisurely explore the area. Today's touring starts with Luang Prabang's Vat Xieng Thong Temple, that is known for its intricately carved woodwork and Buddhist figurines. This is where Laotian kings were traditionally crowned. Next we'll take a boat trip upstream on the Mekong River where we can see the verdant hills and small villages during our cruise to the renowned caves of Tham Ting and Pak Ou, which house hundreds of Buddha statues. Lunch will be nearby, then we will travel by vehicle back to our hotel, with a stop in a rice wine-producing village. We will start our day with a drive to the picturesque Kuangsi Waterfalls, consisting of several levels of falls with inviting pools in between. On our way back to Luang Prabang we will pass villages of the H’mong and Khmu hill tribes. After lunch, we will visit the former Royal Palace (now a national museum) then stop at Wat Visoun that features a famous stupa dating to the 15th century, as well as Buddhist art from around the country. Dinner will be on your own tonight. For those with an interest in traditional Lao culture, we encourage you to attend a performance of the Royal Ballet Theatre. These unique story-telling dances have been performed here for centuries. Laos Extension participants will depart for home today, with hotel check-out by noon. Transfers will be provided to the Luang Prabang airport based on flight time. Early risers can step out at dawn to view the procession of the monks who leave their pagodas to walk barefoot around the city and collect alms. 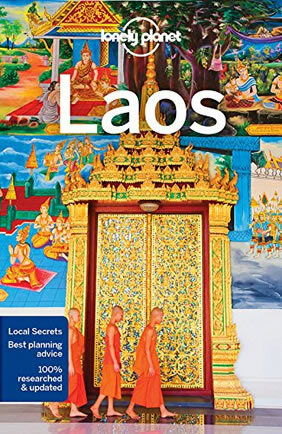 For those with flights later in the day, our guide will offer suggestions as to how to explore more of Luang Prabang this morning. One opportunity is to register for our Elephant Experience. We will venture a short distance outside of town to the riverside Elephant Village, where those who are interested can take a brief elephant ride. All funds raised from this participation are used to care for elephants that have been rescued from logging operations, and to feed their voracious appetites. Afterward, we will head to the airport for afternoon flights. Bon voyage! Arrive in Hanoi, Vietnam (airport code: HAN. Many flights arrive in the late evening, so we will rest and meet the group the following morning. Hotel in Hanoi. Tour of Hanoi, Welcome Dinner. Hotel in Hanoi. Travel to Halong Bay. Overnight aboard a traditional Chinese junk. 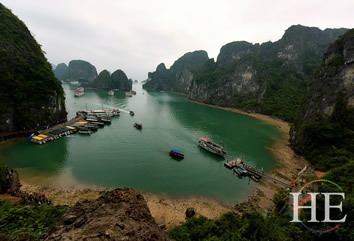 Leave Halong Bay and fly to Hanoi. Hotel in Hanoi. Leave Hanoi and fly to Hue. Hotel in Hue. Tour of Hue. Hotel in Hue. Leave Hanoi and drive to hotel in Hoi An. Tour Hoi An. Hotel in Hoi An. Free day in Hoi An. Hotel in Hoi An. 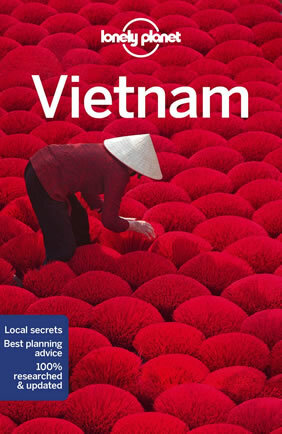 Leave Hoi An and fly to Ho Chi Minh City (Saigon). Hotel in Saigon. Leave Ho Chi Minh City and drive toward Mekong Delta city of My Tho for a cruise. Hotel in Saigon. Fly to Cambodia. Hotel in Siem Reap. 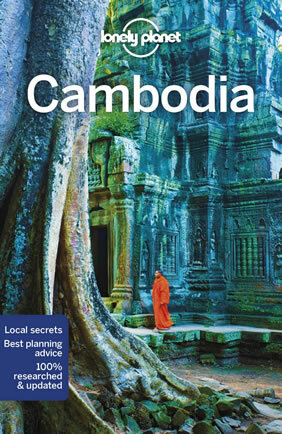 Tour sites around Siem Reap. Hotel in Siem Riep. Tour sites around Siem Reap. Farewell Dinner. Hotel in Siem Riep. End of Main Tour, Departure Day. Flights may be arranged for evening today. Fly to Luang Prabang, Laos. Hotel in Luang Prabang. Tour sites around Luang Prabang. Hotel in Luang Prabang. End of Laos Extension. Departure Day. No group activities. Flights may be arranged any time today. 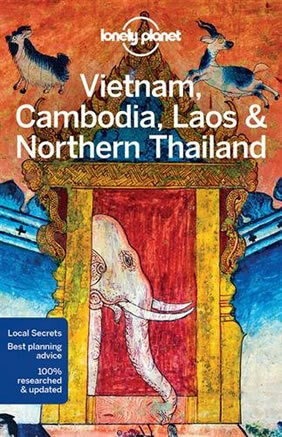 This tour starts in Hanoi, Vietnam and ends in Siem Reap, Cambodia (or Luang Prabang, Laos on the extension). To fully enjoy this tour, one should be able to walk on uneven surfaces at historic sites and be comfortable with weather ranging from warm and humid on the coast to chillier days at higher elevations.